The band will head out on the road with Mastodon this summer. The outing will also feature support from Every Time I Die. “The sonic journey it goes through, we touch on everything.” In a new GW interview, Coheed and Cambria open up about their epic new album. Listen to a New Coheed and Cambria Song, "Old Flames"
The band's new album, 'Unheavenly Creatures,' is out October 5. Band will be joined on the road by Maps & Atlases and Thank You Scientist. 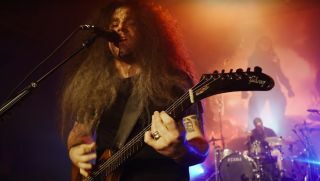 Coheed and Cambria Premiere New Song, "The Dark Sentencer"
Coheed and Cambria Stream New Song, "The Hard Sell"
Prog rockers Coheed and Cambria have just premiered the official video for "The Afterman," off their new album The Afterman: Ascension. Watch it below. Coheed and Cambria have just posted the eight-plus-minute video for a new track, "Domino The Destitute." Watch it below. Progressive rockers Coheed and Cambria have announced ambitious plans to release a double concept album, The Afterman.